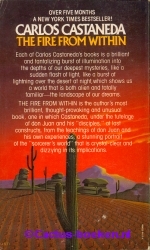 Castaneda, C.- The Fire from Within (1984, Pocket Books) - Mescaline Cactus Specialist - Peyote Cactus, San Pedro Cactus, Peruvian Torch Cactus, Achuma Cactus, Kale San Pedro Cactus ! Titel: The Fire from Within. Conditie: Scheurtje van 1 cm in achterkaft.